A retinal exam – also referred to as an ophthalmoscopy – is an in-office exam used to check the back of your eye. Inside our eye is a very unique part of our body because it is the only place where doctors can see bare blood vessels, a piece of the brain called the optic nerve, and the retina, which is linked to our immune system. Checking the retina is important because a simple examination can reveal the presence of a number of underlying conditions, including diabetes, retinal detachment, glaucoma, macular degeneration, autoimmune conditions and cancer. 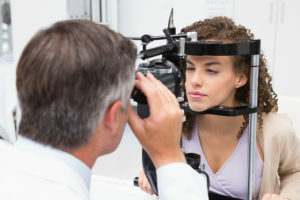 Early diagnosis of these disorders is important for minimizing the risk of vision loss and other health complications. It is important that you share information about your medical history with New Optix Optometry prior to your examination. Medications and previous medical conditions may be connected with your eyes. This is especially true if you are visiting a new eye doctor or you have had changes in your health since your last visit. Bring a list of your medications and allergies, and be sure to discuss any recent or chronic illnesses you have had. You should have a retinal exam on a regular basis. The American Optometric Association recommends annual retinal examinations for patients over 40. If under 40, once a year or every other year should be sufficient to rule out problems. Since retinal exams can reveal so many disorders and diseases, New Optix Optometry doctors will check inside the eye of patients of all ages – including school-age children, every year. Prior to your exam, your eye doctor will put drops in your eyes to dilate your pupils. He or she will then peer into the back of your eye using a special instrument called an ophthalmoscope. Through this device, your eye doctor will be able to view the blood vessels and tissues that surround the retina. Technological advancements has allowed cameras to capture images further out into the periphery, which will supplement the dilation. Following your dilated exam, you may experience some vision blurring or sensitivity to light due to your dilated pupil. Side effects are only temporary, however, and you should be able to return to your normal routine soon after leaving the office. If your New Optix Optometry eye doctor finds anything unusual or abnormal during your retinal exam, you may need additional screenings. Deferring the dilation to retinal photos will not have the dilation side effects.